Created in 2000 by Jeremie Daclin, FILM was originally Cliché Skateboards' sister company. 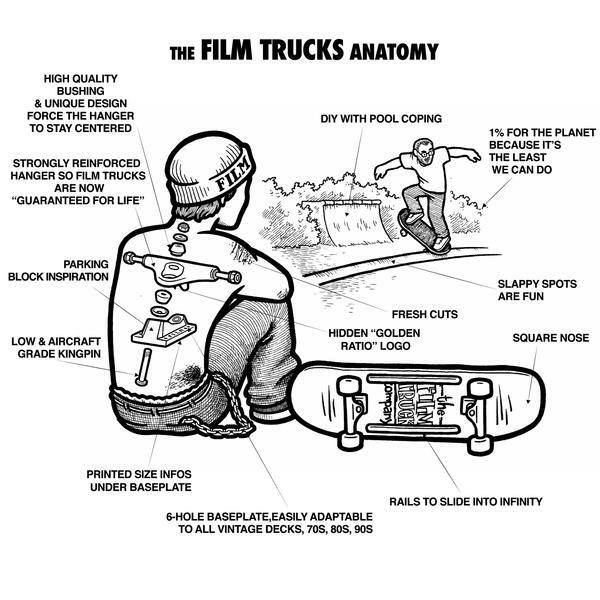 Today, Film Trucks is a reborn - rising from its ashes with unique and original designs. Film Trucks are made to carve, built for slappies, grinding pool copping and having fun on any DIY obstacles. VENDUS PAR 2 _ Black hanger & white anodized baseplate. _ White medium bushing. _Matte circle logo on hanger. _ Silver hardware. Vendus par 2 _ Black matte hanger & Shiny Black baseplate. _ Black medium bushing. _ Film logo print on hanger. _ Black hardware. Collab Film x Soy Panda Full tiffany blue baseplate & silver hanger. White medium bushing. Soy Panda design on hanger. Silver Hardware. VENDUS par 2 Collab Film x Haze Wheels _ Full yellow baseplate & silver hanger. Yellow medium bushing. _ Haze logo on hanger. _ Silver Hardware.